The passing of President George H.W. Bush, who died Friday night at the age of 94, marks the country's first presidential funeral since the one for President Gerald Ford in 2007. Bush is also the fifth president to pass in the last 45 years. Ford along with presidents Lyndon B. Johnson in 1973 and Ronald Reagan in 2004, elected to have full presidential state funerals, whereas President Richard Nixon opted instead for a smaller service in California. • The day has been declared a national day of mourning by President Donald Trump. • 11 a.m.: Friends and family will gather at the National Cathedral in D.C. for memorial service. 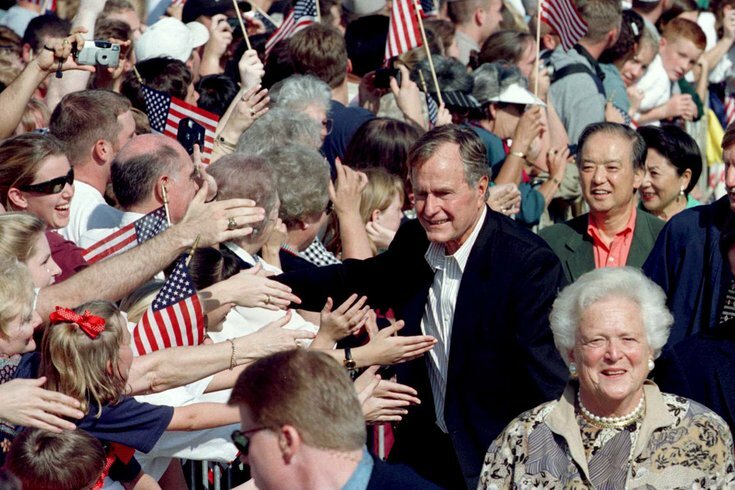 • Following the service, Bush will be taken by motorcade procession to the George H. W. Bush Presidential Library in College Station, Texas, where he will be laid to rest. • 5:15 p.m.: Ceremony and the internment at the Bush Presidential Library & Museum. Bush will be laid to rest on the library's grounds, where his late wife Barbara was buried after her death in April. Their daughter Robin, who died of leukemia as a child, is also buried there. Bush gave a eulogy during Ford's 2007 memorial service, and now speakers for Bush's own services have been announced. President George W. Bush, the oldest son of the late president, will give a tribute during the Wednesday memorial in D.C.
At the Wednesday ceremony, former first lady Laura Bush will also do a reading. Former Sen. Alan Simpson, historian John Meacham, and former Canadian Prime Minister Brian Mulroney are also scheduled to make tributes. In tradition with previous presidential state funerals, we can expect to see a number of personal details throughout the services. The typical presidential funeral is actually a carefully planned event that has been formulated for many years prior to the president's death. This gives presidents, such as Bush, an opportunity to personally contribute to the details of the funeral before passing. Bush, a World War II veteran, will likely find ways to honor the armed services throughout the memorial. All major news networks will be broadcasting the funeral services. CNN will begin covering the services at 3 p.m. Monday.